Just a quick update: We have been running some wonderful seasonal specials which will continue for another week or so. The first, Il Granchio, from Nate Appleman of San Francisco’s celebrated A16 restaurant, has been a hit. Using soft shell crabs from Maryland, not the Dungeness of the Pacific, we sautée them with extra virgin olive oil, white wine, and lemon. Rapini with a touch of anchovy is placed over garlic bruschetta and then topped with these delicate, delicious gifts of the Chesapeake Bay. Fiori di Zucca are another special treat which bring a smile to those familiar with them. The blossoms of the zucchini are filled with ricotta and other treats. They are then lightly battered, fried, and sprinkled with a touch of salt. Another item to make its way into our kitchen is Bietole. 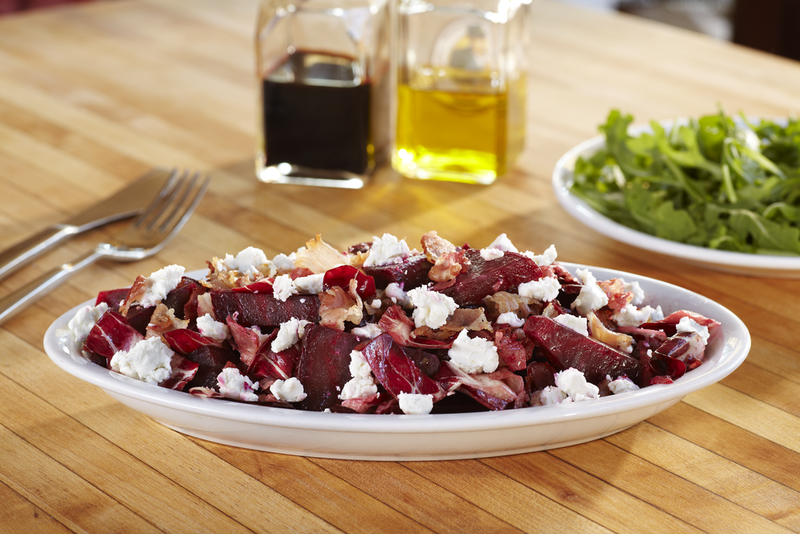 From my aunt Joyce Goldstein’s cookbook, Kitchen Conversations, Bietole is a wonderful summer salad consisting of Treviso radicchio, oven roasted beets, a warm pancetta vinaigrette, and crumbled goat cheese. As in past summers, when the honeydew has achieved its sweetness, we pair it with our Greci and Folzani prosciutto crudo. Come try them while they are still on the menu! Si mangia bene a Spacca Napoli!